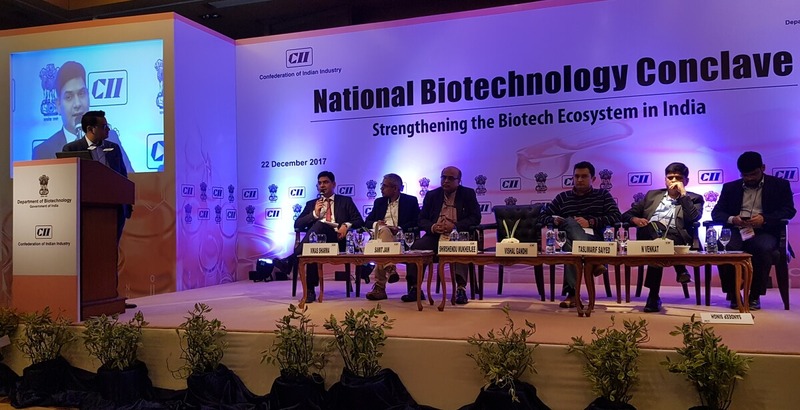 The Confederation of Indian Industry (CII) held its first National Biotechnology Conclave on 22 December 2017 at Le Meridien in New Delhi, India. The Conclave was an endeavour to connect all stakeholders working in the biotechnology ecosystem and to amplify the growth of India’s biotechnology sector to global excellence. H2 Life Foundation participated in the event as an Institutional Partner along with Department of Biotechnology, Government of India; Bangalore Bioinnovation Centre (BBC); Centre of Cellular and Molecular Platforms (C-CAMP); The Delhi Institute of Pharmaceutical Sciences and Research (DIPSAR); Jamia Hamdard and a few others. Mr. Vishal Gandhi - Founder and Executive Director, Bio-RX Venture Advisor Pvt. Ltd.
Mr. Sandeep Singh - Principal, Eight Roads Ventures Pvt. Ltd.
Mr. Sharma shared pertinent information and statistical data on the biotechnology sector in India at present as well as his views and his vision for the future. He also shared that H2 Life Foundation has also been working at boosting the growth of this critical sector which “heals the world, feeds the world and fuels the world”. His inputs were widely appreciated by the panel and the audience. H2 Life Foundation appreciates the initiative taken by CII to promote the growth of this sector which is fueled by innovation and holds the potential to transform lives.